I finally made them! Yesterday was a crazy baking and cooking day. From homemade Mango Popsicles to Fish Taco's and Sauces and Zapple Pie to yes, even Dutch Letters. I was a whirlwind of baking and it felt like 'the good ol' days' before we were thrust into the crazy world of promotions, relocation's, moving across the country and everything else we've gone through recently. Yesterday I baked and cooked up a storm and did not turn on my oven once. It's over a hundred degree's here and I would be nuts to use my oven and spike our electric bill even higher. No, once again I am ever-so-thankful I invested in a solar oven. I baked til my heart's content yesterday on the front stairs of my home. Obviously you will probably bake these Dutch Letters in your oven, which is what I would expect - but if you have a Global Sun Oven® they can be baked with solar heat easily as well. On to the recipe! I previously posted a recipe for Dutch Letters here on An American Housewife, but yesterday I had Puff Pastry on hand leftover from the last time I made Cream Horns. If you want a quick and easy version of Dutch Letters I can tell you it worked great, was fast and tastes just like the pastries you find in any bakery. In a medium bowl, beat almond paste and 1 egg white on medium-high speed of a hand mixer until smooth. Add the sugars, molasses and vanilla and beat until smooth, 1-2 minutes; set filling aside. In a small bowl, whisk together remaining egg yolk with about 1/4 cup water. Unroll dough to a lightly floured work surface. Roll dough lightly into a larger rectangle. Cut rectangle into strips about 2 1/2 inches wide. Working with one strip at a time, put 1 heaping tbsp. filling lengthwise down the center of the strip, using your fingers to spread it to each end. Using a pastry brush, brush egg wash down one edge and then, beginning with the dry side, roll strip over filling and into a cigar shape or a rope. Transfer pastry rolls, seam side down, to a parchment paper-lined baking sheet and form into an "S" shape; repeat with remaining dough, filling. and egg wash.
Heat oven to 375°. Brush each pastry with egg wash and sprinkle liberally with sugar. Bake, rotating baking sheets once halfway through cooking, until golden brown, 30-35 minutes. Transfer to a rack and let cool for 20 minutes before serving. Although I'm not a fan of eating desserts like cookies and cakes... I am a fan of cookie dough and cake batter. It's probably a little weird that I don't really like chocolate cake, but I love eating chocolate cake batter. Ever since I was a kid I've mixed cake mix with water (leaving out the oil and egg) and enjoyed just the batter. However, I, like most people, have also eaten raw cookie dough with a spoon while making cookies. Although the chance of salmonella poisoning is remote and small, it is present - so for that reason, whenever my kids wanted cookie dough, I would simply mix up the recipe but leave out the eggs. Did a light bulb just go off in your head? Something I have done for almost 20 years now is make cookie dough without eggs and freeze the dough balls on a baking tray in the deep freeze before transferring to a ziploc. Needing a sweet treat, wanting a bite of comfort food, or just craving cookie dough? Not a problem when it's right there and perfectly safe sans eggs! But there is also a great way to have your cake and eat it too.... (sorry, couldn't help myself). To make edible raw cookie dough that you can enjoy and still make cookies out of, consider using Powdered Whole Eggs. They are pasteurized so they are safe to eat, but because you still have eggs in the recipe, you can bake them as you usually would and have both edible raw dough AND freshly baked cookies! In a bowl, with an electric mixer on medium speed, beat butter and brown sugar until well blended. Beat in vanilla until smooth, scraping down sides of bowl as needed. Add a mixture of the flour, baking soda, and salt. Stir or beat into butter mixture until well incorporated. Stir in chocolate chips. ***Note: You can leave the baking soda out if you like since you aren't baking them, but if you leave it in, it tastes a little more authentic. If you want to make this recipe into baked cookies, simply add 2 eggs to the recipe when you add the vanilla. And your third option; using Powdered Whole Eggs equal to 2 eggs means you can eat the dough AND bake cookies from the same recipe. Sunny days and hot weather... I love it! But I don't love heating up my kitchen for dinner when it's almost 100 degrees outside so this week I'm planning meals around my solar cooker (Global Sun Oven® ) and cold side dishes. This is a salad you can throw together quickly depending on what you have on hand, what is in your garden and/or what your family likes. A staple in our home since Sam's Club started to carry it is; Olive Garden's Salad Dressing. If you don't have a Sam's Club near you or aren't a member, you can purchase it online too (Olive Garden Signature Italian Dressing) . We love the Olive Garden dressing not only for salads, but my husband requests I keep it on hand as he uses it on his sandwiches and on his pepperoni pizza. Remember; add or leave out as you wish! I make this different every time. Mix and toss with about 2/3 c Creamy Italian Dressing just before serving. Southern BBQ. Spicy pulled pork with a hint of sweetness to offset the vinegar based marinade. Oh so good and so easy! Years ago (while I was living in Northern Minnesota and not even remotely near the deep South) I fell in love with a vinegar based Southern BBQ. While the phrase bbq typically means "tomato based" or "red" up North, in parts of the South the only good bbq hasn't a hint of tomato in it. It's a wonderful mixture of cider and white vinegars with red pepper flakes and a smoky tang. And that is the bbq pulled pork I came to love about 15 years ago and have enjoyed ever since. I used my new Global Sun Oven® to cook the pork but obviously you can use your oven or if it's a hot day - your crock pot! I was just so thrilled to try solar cooking that I took advantage of our sunny weekend and made not only the pulled pork, but the homemade buns as well. They turned out perfect and I'm hooked on Sun Oven cooking. I've made this many ways and one option you have is to cook the meat first and add the marinade after cooking or cook the pork in the marinade from the start. My own experience has shown the bbq is more spicy and not sweet if it's been cooked in it and is a bit more mild and sweet if added after cooking. I would suggest if it is for your family or kids or a large group, I'd add the flavoring after cooking. If it's for adults who like spicy bbq and not much sweetness, go ahead and cook it in the vinegar based marinade. Cook in a slow cooker or crock pot all day with just salt and pepper seasoned until it's done and so tender you can shred it with 2 large forks. Shred the meat in about a cup of it's own cooking juices while warm. Add to the shredded meat. At this point you can let the whole thing cool down and refrigerate over night or even package it up and put it in the freezer for a later date. The setting time allows the flavor to really set in and it's amazing. However you can serve it right away. I would try to let it cook in the slow cooker for at least an hour or two before serving if I had the chance, but you don' t have to. As it sets, the liquid will be absorbed by the shredded meat so it gets thicker the more time it sits. Serve on soft buns or rolls with condiments such as dill pickles and mustard with some coleslaw on the side and big glass of sweet tea! I've made this pie about 40 times. Here is a photo from 2006 - made FAST with a store bought crust! 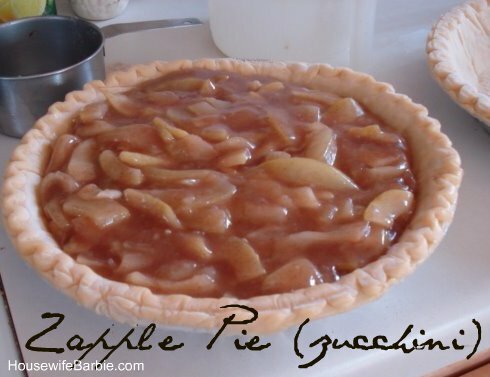 Back in 2009 I posted about my then 13-year-old begging me to make her favorite pie: Zapple. Actually it's a toss up between Appie Pie and Zapple Pie because they taste the same. One made with apple and one with zucchini but if you don't tell... no one will ever know! Just slice the zucchini to look like apples and you are off to one amazing pie everyone will rave about. That 13 year old is now 16 but she still hasn't stopped asking for this pie about every 4 - 5 months. Now that our zucchini plant is going CRAZY with zucchini offerings I am more than ready to make this again. I even picked up some yummy French Vanilla ice cream at the store yesterday to serve with it. Warm Zapple Pie and ice cream or whipped cream... oh my. Don't forget the vent holes to let steam escape! Letting it cool... the hardest part! I love old recipes. Recipes that my Great (or even Great-Great) Grandmother would have made as they tend to be simple, frugal, natural and comforting. 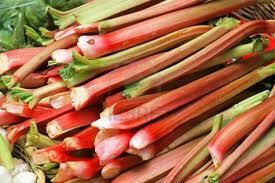 In the Spring and early Summer I crave rhubarb. Interesting since I didn't really grow up eating much of it. I do remember eating it straight from a neighbors patch when I wasn't much more than a toddler, and learning on my own which rhubarb was sweeter and ready and which was green and oh so sour! I think my mother likes rhubarb but she didn't do a lot of baking and I don't remember having it often. I looked forward to church pot lucks and school functions where parents would bring cookies and bars for everyone to enjoy after, to get my rhubarb crisp and rhubarb cake and bars. If you have a patch of rhubarb, you are lucky! If not, you'll have to do as I do and buy it at the store. This old fashioned recipe calls for fresh, but if you buy the frozen, bagged rhubarb at the grocery, well that's just fine too! This one uses healthy bran cereal, which I thought was brilliant. Grease or spray an 8X8" baking dish or pan. Place the diced rhubarb. Cream together the sugar and butter then add the milk. Add the flour, baking powder and salt along with the cereal. Spread this over the rhubarb. Mix together the topping ingredients; sugar, cornstarch and salt. Top the batter with this and then pour a half cup of boiling water over all. Bake at 375 for one hour. Although I ordered it yesterday morning, I'm still in my own 'happy place' about the Global Sun Oven (Solar Cooker) I ordered yesterday morning. We moved across the country about six months ago and since getting settled here in our new home, I've been working on getting our emergency storage built back up. Having lived all over the country we have experienced everything from wildfires to earthquakes, tornado's to flooding. So far our power and our water have never been out longer than 4 1/2 days but that was enough! It makes me feel better to be prepared to care for my family if and when disasters and power outages strike. After researching online for six months I decided on the Global Sun Oven brand along with the accessory kit. It shipped yesterday so it should be here soon. I can't wait to show my readers photos and recipes as I start to cook with it! In the meantime, I decided today was a 'cookie' kind of day... but with a healthy twist. Bran. No one will know but you! I would also suggest cutting down on some of the sugar by using simple substitutions like Sugar Free Chocolate Chips, Splenda or a Xylitol substitute for part of the sugar. Stir together flour, soda and salt. In large mixing bowl beat butter and sugars until light. Add eggs and vanilla. Beat wel. Add hot water. Add cereal, flour, nuts and chocolate chips. Mix and drop by teaspoon on baking sheet covered with cooking spray or parchment. Bake at 375 for 15 minutes. Cool. I have spent the last 3 days thinking about making these pops. Originally, my 16 year old daughter sent this recipe to me from one of her gazillion 'finds' on Pinterest. (I don't do Pinterest but she spends enough time on there for both of us! Ha ha) I thought it looked fun and yummy so I printed off a copy and then saved it to my website file collection so I could make them. Today might be the day! 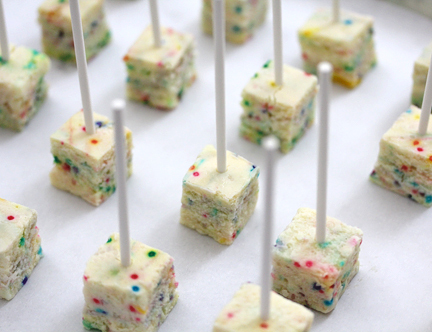 Even though we have a chocolate cake with fluffy white frosting on the counter and a white cake ready to be made into a trifle, I cannot stop thinking about these fun cheesecake bites. Beat cream cheese and sugar until smooth. Turn mixer speed to low and add heavy whipping cream and vanilla extract and mix to combine. Add one egg at time and mix to combine. Divide batter into three even portions. Pour first portion into pan and sprinkle 1 tablespoon of nonpareil on top. Pour the second portion of the cheescake batter directly on top and then sprinkle the second tablespoon of nonpareils. Repeat this again for the last layer. *Do not stir. The nonpareils will streak if mixed. Create a shallow water bath by placing the cheesecake batter filled pan in a large roasting pan or casserole pan and filling it with water a 1/3 of the way up. Bake at 350 degrees for 30 minutes. Cool finished cheesecake on a cooling rack. Place chocolate and heavy cream in a bowl over simmering water. Let chocolate and cream sit for 2-3 minutes to melt without stirring. Then slowly stir mixture to combine. Add powdered sugar and mix to combine. (Mixture will look seized but the water will smooth it out). Add water 1 tablespoon at a time, mixing after each addition until pouring consistency is reached. Set aside and let sauce cool to warm. Place chocolate and heavy cream in a bowl over simmering water. Let chocolate and cream sit for 2-3 minutes to melt without stirring. Then slowly stir mixture to combine. Add powdered sugar and mix to combine. (Mixture will look seized but the water will smooth it out).Add water 1 tablespoon at a time, mixing after each addition until pouring consistency is reached. Set aside and let sauce cool to warm. Cut cheesecake into ½ inch squares. Place squares on parchment paper. Cover with plastic wrap and freeze. Remove from freezer and let cheesecake rest at room temperature for about 10 minutes. Insert Lollipop sticks and push a small marshmallow on top. Dip cheesecake pop in white chocolate and place on a clean sheet of parchment to dry. Once dried, pour milk chocolate on top and sprinkle with nonpareils and jimmies. This week my teenager wanted to make a cold cheese dip. I gave her free reign of the kitchen and before I knew it, she had made a huge container of a cold cheese dip that used up all the cheddar in the house, all our jalapeno's, most of the mozzarella and more than a few other items by the time we finished 'fixing' the rather bland dip recipe she started with. The end result was a delicious cold dip for potato chips, tortillas or pita chips but.... there was just the two of us here this week! My other two kids are away at school and my husband was on a business trip. We ate our fill as a dip. Then we made some into spiral wraps on tortillas. Another day I heated it up and ate it as a melted hot dip with pita chips. Finally, the 'cheese spread that wouldn't die' was made into delicious impromptu cheese pockets thanks to a can of crescent rolls. Whew! The dip was good but after 3 days we are glad to see it used up. If you have made a rich cheese dip of any sort (the kind made with a mixture of cheddar and mozzarellas or cream cheese, along with mayonnaise or sour cream and a dash of spices such as onion or garlic powder, chives or onions and spinach or jalapenos) please feel free to make them into pockets! Simply separate the triangles (8) from a can of crescent rolls. Fold them over on themselves to form a rough square or rectangle shape and then use a rolling pin to roll them out to a large rectangle. Place about a tablespoon of filling on one side and fold over, press to seal the edges. Bake on a non-stick baking sheet at 350 for about 12 - 15 minutes until golden brown. *Note you can also add a bit of pepperoni and/or sauce to this as well to give it a pizza flavor - which goes well with most cheese dips. A bountiful harvest of vegetables await in this yummy dish! My family doesn't care for casseroles. I admit I'm not a huge fan of them either - but when it comes to this one, I could eat half the pan myself and then finish the second half the next day for lunch! Ok... I may have just done that this week, but don't tell anyone. I keep this 'basic' recipe idea in my proverbial back pocket and then I use the vegetables I have on hand. This time around the plan was to use up the first zucchini of the season from my own garden! I didn't plant carrots this year and didn't have any fresh, but I had picked up a can of carrots last week with this casserole in the back of my mind. It's going to remind you of something your Grandmother has made... probably because she has. It's a throw back to the generation of using crackers and cheese to top every casserole known to man and those crackers and that cheese make this so delicious, however, you can leave off the cheese and leave out the crackers if you really, truly want to make this a lower fat option. Put the well drained zucchini or yellow squash and onions into a mixing bowl. Add the carrots, egg, butter, mayonnaise, sugar, half the cheese, half the crackers crumbs and the cayenne and salt and pepper. Mix gently. Put into a buttered casserole dish. Top with the remaining cheese and cracker crumbs. Bake at 350 for aboout 20-25 minutes until warmed through and golden. The first zucchini of the year from my garden! But I love the flavor so I use the cheese and crackers to top!